Flowers have a way to win ladies' hearts. Be it a single stalk, three stalks, a dozen or 99 roses, your special someone will feel so loved upon receiving it from you. 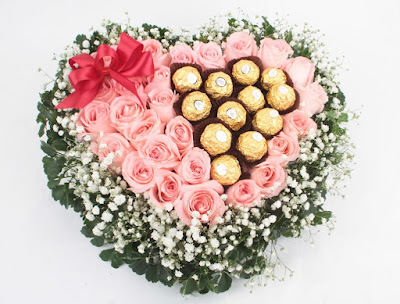 Let me give you some tips on how to pick the right Valentine flower arrangement to give your girlfriend/potential girlfriend, wife, daughter, sister or mom. Every girl/woman have her own favourite colour and when they receive a flower or a bunch of flowers in that specific shade, it will multiply your handsome points exponentially! Why? Because it means that you are being thoughtful. If you don't know her colour of preference, go ask her bestfriend. If you have no one to ask, go for the universal colour of love, red or read my next tip below. Case scenario: You are still in the stage of wooing your lady, don't know what's her favorite colour yet, you have no one to ask, and you try to shy away from giving a red flower because you find it too common. Fret not! Just let your sense of smell work double time! Every time you go on a date, try to get yourself familiarize with her perfume or cologne. If she is not fond of wearing perfume like myself, it's a hint for you not to buy flowers that have a very strong scent. Chocolates and flowers are more like salt and pepper, fries and ketchup, coffee and cream. I know it sounds so corny but that's how it works. It's like match made it heaven, just the way other things and people are. Find her favourite chocolate brand and variety (white/dark/regular, with or without nuts/fruits) and get a reliable florist to incorporate it in their flower arrangement like in the photo above. 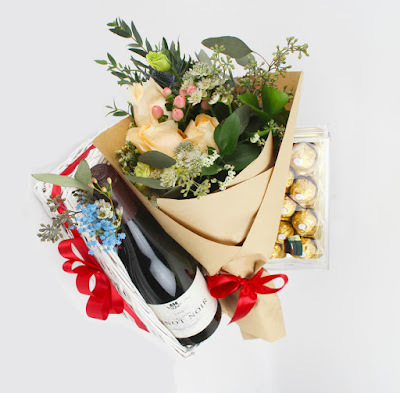 If you are married or engaged, add a wine to your flower bouquet and box of chocolate and go for a staycation with your fiancée or celebrate at home with your wife. One of the happiest and most memorable Valentine I had with my hubby happened right at the heart of our home so why not bring your wife home some flowers, chocolate and a wine and celebrate the special night together sipping red wine? Definitely a wine will complete it! It will surely spice up the night.